Is it a watch? Is it a phone? Just as the line between phone and tablet is blurring, so too the distinction between handsets and wearables, as proven by this curved screen that's perhaps best described as a wristable. British company FlexEnable was spotted at the recent Mobile World Congress in Barcelona demonstrating the very latest version of its 4.7-inch curved display, but this isn't anything like the fake flex found in so-called flexible phones like the LG Flex 2 or the Samsung Galaxy Round. This one has a vicious curve that sees it stretch around the wrist. Cambridge, UK-based FlexEnable has been working on the screen for a year or so, and the new version of the wraparound "wristable" is fitted with touch sensors. That makes it immediately feel more like a real product than the prototypes it's shown in the past. Plus, it also plays video. In the demo we had in Barcelona – amid the boffins in the cutting-edge Graphene Zone – this novel curved wearable was displaying the time along with scrolling news, a music library, a photo album and a free-drawing app. It wasn't running sophisticated software, but it was clear the device does everything an LCD-based smartphone does – including playing smooth video content on its large screen – but in a smartwatch-like form factor. However, what marks this out is how it feels; drag a finger around its touchscreen and it's instantly obvious that it's made not from glass, but from plastic. So what enables this strange hybrid device? The answer is organic LCD, or OLCD, which is essentially a glass-free display that uses flexible, often plastic substrates and sensors. Remarkably, that allows the screen itself to be only 0.3mm in depth, which does suggest that mainstream wearables are now due a massive makeover using flexible electronics. Another advantage of using plastic over glass is it's lighter, and less likely to break. With the touchscreen added and it strapped to a wrist, the device essentially becomes a hands-free phone. So what could it actually be used for? "It's probably not for consumers, but potential customers include warehouses, where employees carry around a device to check the stock," said a spokesperson for FlexEnable. "Usually they only have one hand free, but with this device on a wrist both hands will be free," she added, stressing the importance of integrating touch sensors so that staff could write messages without needing to use two hands, or reach for a phone. In terms of productivity, it could be everything a smartwatch is not. FlexEnable had some other goodies at MWC 2017 that could have uses in mobile devices. The most interesting was a Kindle-sized e-ink device that used miracle-material graphene as the 'top pixel'. As well as being the strongest and most conductive material known, graphene is super-thin and flexible making it ideal for using in electronic devices. "We replaced rigid indium tin oxide, a transparent metal, with printed graphene to improve the flexibility," said Dr. Rouzet Agaiby, Senior Business Development Engineer at FlexEnable. It's a reminder that e-readers like the Kindle, Kobo and Nook are only thicker than paper because they're on glass; transfer them to plastic substrates using plastic components and they become thinner, lighter, and flexible. However, graphene is more and more being considered ideal for the display industry that serves the companies that make portable and wearable devices. Late in 2017 researchers at Delft University of Technology in the Netherlands announced that they had prototyped two atom-thick graphene-based pixels that could, using pressure, be used to create colour e-ink displays. 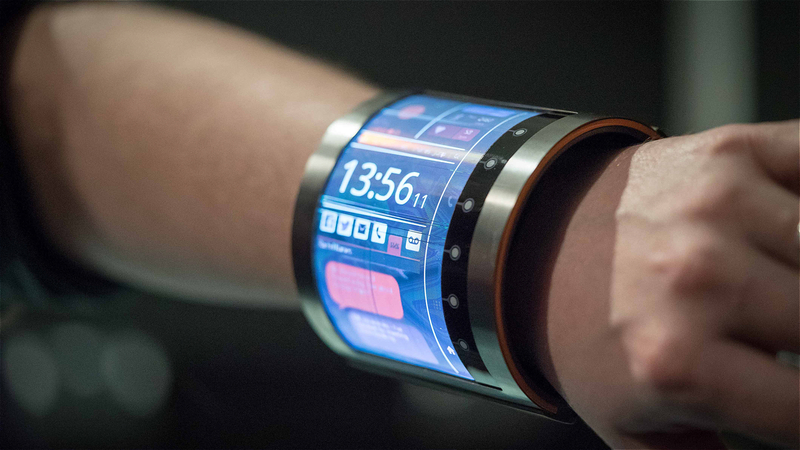 FlexEnable's do-it-all wearable reminds us a little of the Rufus Cuff, another mammoth wrist-worn device. Although unlike the Cuff, the FlexEnable wristable isn't really targeting consumers like us. Still, it's a neat proof of concept, and a peek into our inevitable flexible future.